What's the sales process Channel Partner sales reps are to follow? Home → Uncategorized → What’s the sales process Channel Partner sales reps are to follow? 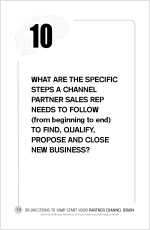 What are the specific steps a Channel Partner Sales Rep needs to follow to find, qualify, propose and close new business? One thing you learn in the franchise business is that success boils down to two things: Marketing and Training. Everything else is icing on the cake. McDonald’s Corporate in not in the hamburger business. They’re not in the restaurant business. I suppose you could argue that they may be in the real estate business, and to a certain extent they are. But the real business of McDonald’s is training and marketing. In fact, they’ve perfected each so well, that by virtue of graduating from their amazingly detailed training program, people knowing nothing about making hamburgers or running a restaurant can be a smashing success. Their program is so good people are willing to pay money for the opportunity to “work for them.” That’s what franchising is all about. Having spent four years at Productivity Point International, a franchisor of instructor-led training (a booming field before the internet came along), I continue to be surprised to find manufacturers who haven’t adopted this same concept… that their training would be so well honed that Channel Partners would actually want to pay for it. You at least have to admit this is a worthy goal, no? TREK – Thinking/Training. Reaching. Engaging. Keeping. In 2005, I wrote my first book, The Marketing Playbook, on the topic of B2B marketing. Borrowing from pro football, the book contains more than 100 marketing “plays” (or strategies), each with step-by-step instructions for properly executing a given marketing strategy. Marketing strategies included strategic messaging workplans, white papers, dimensional direct mail, springboard discussion documents, case studies, press releases, etc. In order to tie everything together, each marketing strategy is mapped to a specific stage in the sales process where the strategy performs best. I provide a color-coded, generic sales process diagram to serve as a visual aid, which is divided into the four main food groups of selling (Thinking/Training. Reaching. Engaging. Keeping). 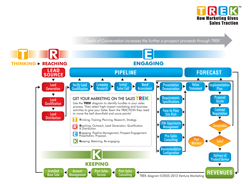 You may download a copy of my TREK sales process diagram here. The TREK diagram is the backbone of my consulting business. Each consulting assignment begins with a full-day walk-through of my client’s sales process to determine where marketing can be applied to help the sales team jump identified hurdles. My team then recommends specific marketing strategies, a budget and necessary internal and external resources. The net result—true to the football motif—is a Marketing Game Plan. The reason I mention TREK and the consulting we provide is this: I have yet to meet with any company (big or small) that has adequately mapped their own sales process. And I’m not talking about “borrowing” the template from your CRM vendor. I mean the process you’ve discovered in your own business through trail and error and a lot of hard knocks. Litmus test: Do YOU believe it? Your sales process is what you expect your own reps and your Channel Partners to follow. If you expect your Channel Partners to lead with your product, in most cases they’ll be risking some amount of relational capital. If they introduce your products, will they perform as promised? And if reps take this first step, how can you reward them for doing it? Ultimately, you’re going to find that if you really want to be successful selling through Channel Partners you’re going to have to eliminate the risk. And there’s no better way to do this other than by guarantying success and incenting sales reps at each stage of the sales process. If you are unwilling to do this then I’d argue that you want your Channel Partners to believe something you don’t.